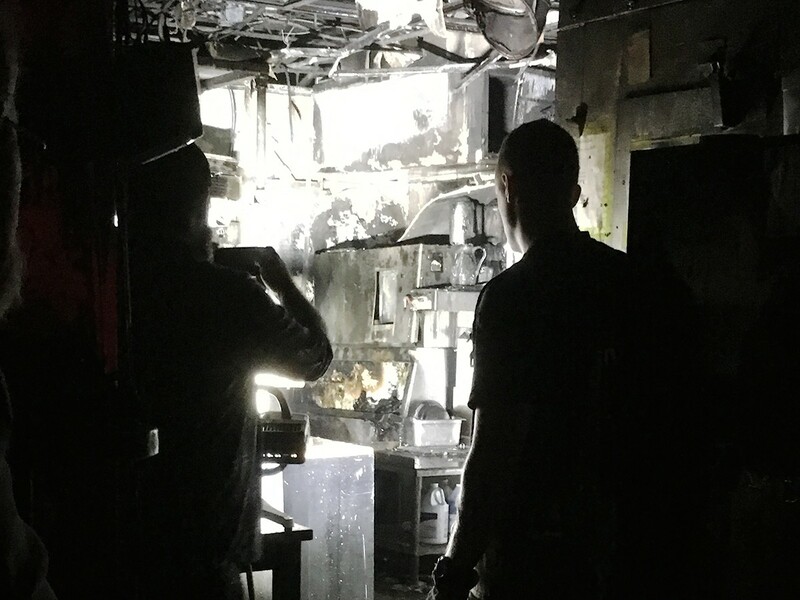 A sorry sight: the kitchen of Southern Goods restaurant in The Heights was gutted by fire last night. Photo by Maureen Demar Hall. Last night at approximately 11 p.m., a fire started at Heights restaurant Southern Goods, located at 623 West 19th Street. It started about an hour after closing time. Heights resident Maureen Demar Hall, who lives close to the restaurant, noticed it was surrounded by fire trucks and shot the video below showing smoke billowing from the entrance and roof. After the fire was put out, Hall was able to go inside and take photos. Those show the kitchen was almost entirely destroyed. Heavy soot covers the entire bar area and its contents. Amy Woodward, a representative for Southern Goods, says the extent of the damage is being assessed this morning. At this time, the cause of the fire is unknown, as is how long the restaurant will be closed for cleanup and any necessary rebuilding. This is a developing story and we’ll update it if we receive additional information. So sorry to hear about this. We will be there to continue our support when you rebuild.